You know, the Russian Army has a long tradition of using inflatable tank and artillery mock ups as maskirovka, which is camouflage/deception elevated to high art. In fact, the Russians have stocks of inflatable vehicles ready for use in some near future conflict in case they need to employ some clever shadow tactics to their advantage. 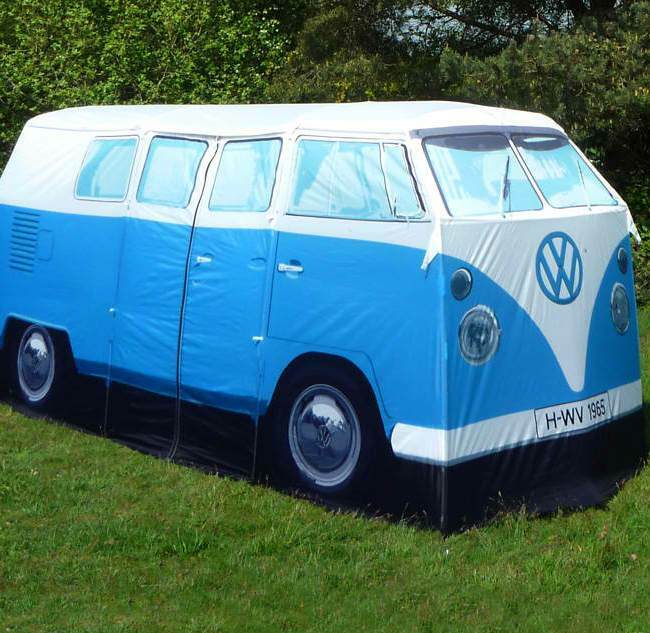 This novelty tent shaped like a VW van almost accomplishes the same, except almost a handful of campers can fit inside for snugness and warmth. If you love music, mud and Mother Nature you’re probably heading to a camp site at some point this summer. But why take shelter in some dull, conventional tent when you can recreate the Summer of Love in the hippie-tastic VW Camper Van Tent. Officially licensed, this stunning four-man (or lady, natch) tent is a luxe, full-size replica of the iconic 1965 VW Camper Van synonymous with 60s counterculture. It’s so evocative you can almost hear the Mamas and the Papas singing California Dreamin’ every time you feast your eyes on its beautifully breadloaf-ish form. Indeed we half expected Mama Cass to tumble out when we first saw this groovy Vee-Dub. You’ll be the envy of the campsite! The VW van tent is currently available in three smashing colors and sells for a little less than three hundred quid, so in case you want to get a few laughs on your next trip to the country, better plop down the necessary cash.